Merciful Machine Angel was the draw power mentioned at the start of the week. While giving up a Cyber Angel on the field may not seem practical, if it means gathering resources just to get it back I think it is worth it. A +1, you’ll have to put a card on the bottom of the deck upon resolution, but it can be worth it. Tributing Idaten or Benten will help your situation, whether pumping up your Cyber Angels by 1000ATK or getting a LIGHT Fairy from your deck. You can put back a LIGHT Fairy and then search it off of Benten. You may be locked into Ritual Monster Special Summons this turn, but that is what the deck does. Also, you can do your other Special Summons before activating Merciful Machine Angel and then restrict yourself to your Ritual Summons. With the amount of searching a Ritual deck can do nowadays the putting one card back drawback isn’t much of anything. Well this draw card won’t get banned anytime soon. Merciful Machine Angel is a once per turn Normal Spell Card that costs a tributed Cyber Angel Ritual Monster from your field or hand to draw 2 cards. Then you put any card from your hand to the bottom of your deck. You’re also restricted to Special Summons of Ritual Monsters for the rest of the turn. This card is an inherent minus in advantage, but I think it’s searchable. However, there are better, easier, less restrictive, and stronger draw cards these days. Some monsters will get effects off the tributing cost, but Merciful Machine Angel is still at best run at one while the better draw cards are run in multiples. Up next for Cyber Angels, we got some draw power in Merciful Machine Angel. Merciful Machine Angel is a Normal Spell that tributes 1 Cyber Angel Ritual from your hand or field to then let you draw 2 cards and then put a card from your hand back to the bottom of your deck and for the rest of the turn after this card resolves, you cannot Special Summon monsters except for Ritual Monsters. Well the draw 2 at the cost of tributing something is nice, but having to put a card back can sting unless you got a brick in your hand that you’d prefer to have in your deck for a later time. The card is a natural minus 1 unless you tribute something that gives you a search in return (Spoiler Alert: There is) but still seeing two new cards can help if your hand isn’t that optimal. 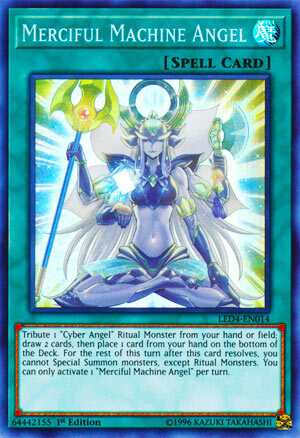 Being locked to Ritual Monsters will shut down your Ritual Sanctuary unless it revives a LIGHT Fairy Ritual, but that’ll require several Spells in your GY, but Ritual Summoning is still common in Cyber Angels and thankfully your Rituals don’t have to be Cyber Angels so you can use cards like Herald of Perfection or Saffira, Queen of Dragons which are both solid Ritual Monsters in Cyber Angels. Other than a few Extra Deck plays maybe, the restriction doesn’t hurt too bad except in Impcantation variants, but you’d probably use those first, and it hurts with the Star Seraph engine, which again you’d probably use first. The rest of your monsters are Normal Summons for most of the benefits, so playing a few Merciful Machine Angel cards in your deck won’t hurt that bad if you play it right. Art: 4.5/5 Izana looks very peaceful here, but shocked she isn’t censored that much here. Merciful Machine Angel is our card for the midweek. By Tributing a Cyber Angel Ritual Monster from your Hand or Field, you get to Draw two cards. Drawing is good, and I’m hoping you’re ridding a Monster from your Hand, it wouldn’t be very beneficial (and a loss of advantage for you) to get rid of one you took the time to Ritual Summon to your Field. Next, after the Draw, you place a card of your choosing from your Hand, on the bottom of your Deck. So, now we’re technically at -1 here: we gave up a Magic card and a Monster card to Draw 2 (which is break even) and then you lose a card after. For the duration of the turn you play this, you can only Special Summon Ritual Monsters, and only one of these can be activated per turn. I honestly don’t see this as a necessary piece in this Deck, but that’s not to say it’s bad. Drawing is good, the effect is easy enough to accomplish, and the restriction involved is hardly a crippling one. It’s always helpful to be able to Draw more cards after all. Personally, I wouldn’t fault a player for not using this, nor would I for using one (but I wouldn’t use more than one). Art: 5/5 Simple, but happy, peaceful, tranquil, I like the feelings I get from this card.